The Pumpkin Man is my twenty-eighth book, my tenth one-shot adventure and my second book set in the newly revealed portion of my campaign world, The Dales; the ancestral homeland of the halflings, gnomes and dwarves of this realm. It's a dark & stormy night, & your party seeks refuge at venerable Foggybottom Manor. All is not as it seems, however, & you find yourself involved in a quest to rescue your hosts' kidnapped children from the clutches of an ancient Fae creature known as The Pumpkin Man! It was written such that the GM begins to tell the players a scary story that then morphs into an interactive spooky story told by the GM & players! It takes places in a graveyard that's actually in the land of Faerie! It doesn't really get better than that on Halloween! This 20 page adventure, is intended for a party of 4-6 players of levels 4 to 6. It offers one spooky evening of play time and it is sure to please discerning GMs and players looking for a great scary adventure to run on Halloween and Samhain! Available NOW as a PDF directly from us, this book is currently available for the low SALE price of only $5 for one week (till 7 November) in hounour of the Halloween and Samhain festivities! A sudden downpour forces you to seek shelter at Foggybottom Manor. While the manor seems inviting, you soon discover all is not what it seems. An evil being has kidnapped the family’s children as part of an ancient curse! Can you defeat the creature, rescue the children and save the day? This is a holiday themed one-shot module designed for use as an evening’s worth of adventuring on Samhain, or as it is better known in the modern world, Halloween. It's a dark & stormy night, & your party seeks refuge at venerable Foggybottom Manor. All is not as it seems, however, & you find yourself involved in a quest to rescue your hosts' kidnapped children from the clutches of an ancient Fae creature known as The Pumpkin Man! The adventure in this module takes place in and around Willowston a halfling village located in a heavily wooded area of The Dales, a large land mass in the author’s campaign world comprising a large fertile valley surrounded on all four sides by nearly impenetrable mountains. The Dales is the ancestral home of the halfling, gnome and dwarven races on this world. The manor house where the action occurs is situated 3 miles outside the village, along a trade route. The events herein occur on the evening of Samhain, when the veil between this world and the next is thin and it is easier for beings from the Other Side to cross over into ours. This supplement contains a completely original HOLIDAY ONE SHOT adventure, which was written as a sort of interactive ghost story told by the GM and the players! There is a good deal of exposition as the GM sets the mood for this otherworldly adventure!! This module was written for and works best with a group of 4 to 6 player characters of 4th to 6th level. The entire module should be playable in one evening of play. Inside you will find great Old-school art and detailed maps: including a map of Foggybottom Manor; dungeon map with keyed encounters for each area; and a fully detailed Old School world map of The Dales, with information for further exploration. Many nights of role-playing fun in this new territory are right at your fingertips! This adventure provides further details on the exciting new expansion to the author’s campaign world, further opening up the homeland of the small folk to adventures with you players. The Dales, along with the nations of Alderburgh, Jarlburgh, Dùn Bhriste and The Red Eagle Barony, now brings the author’s camping world to five separate nation states to explore! 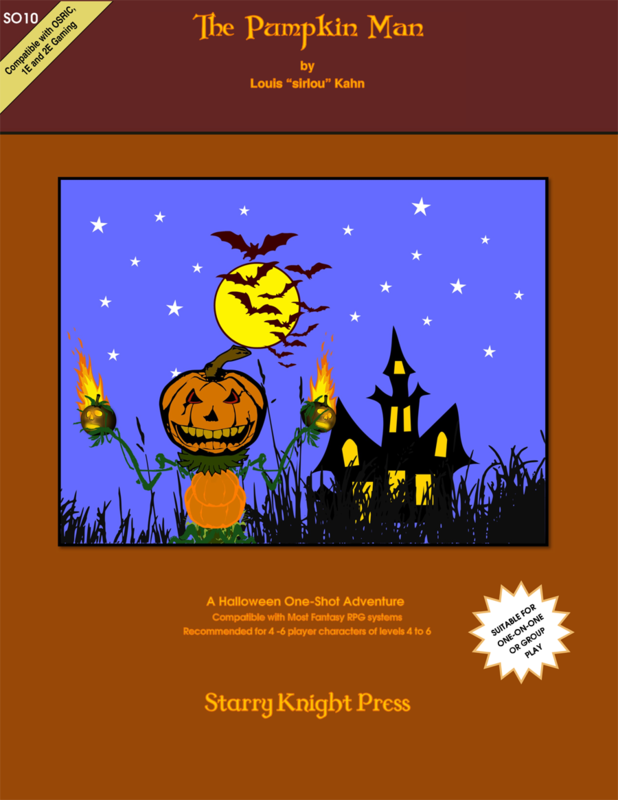 This book features 20 pages of excitement and thrills, and this spooky adventure is sure to be a hit with discerning GMs and players celebrating Samhain, All Hallows Eve and/or Halloween! 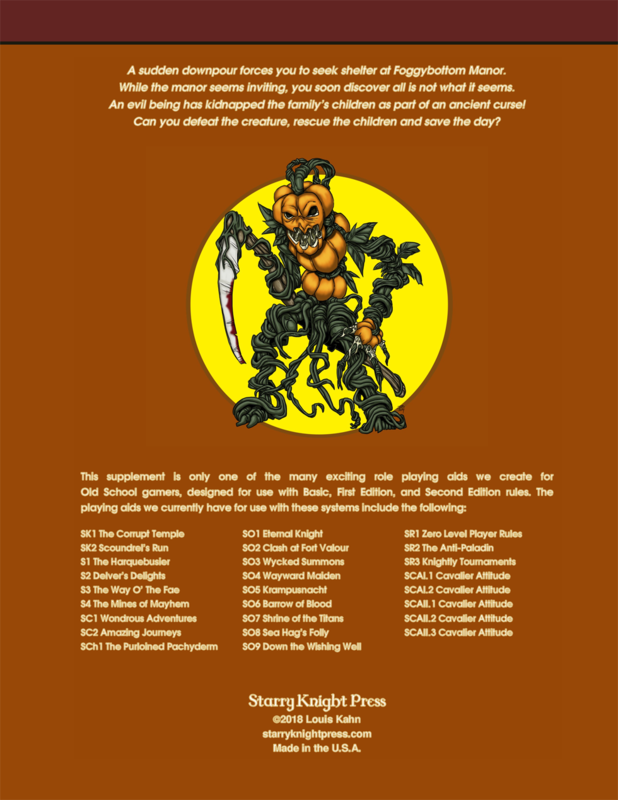 About this site: Starry Knight Press is dedicated to one simple proposition -- providing GMs and players alike with the very best in adventures and game supplements for use in your Old School & OSRIC compatible campaigns. We thank you for your interest and support.